What is Deluxe Flea & Tick Yard Spray And Home Fogger Combo Pack? When you have a larger home and yard, it's important to treat the entire area to eliminate fleas. In this combo pack, you get Sentry Flea & Tick Yard and Premise Spray Concentrate, which covers up to 2667 sq. ft. and 6 cans of Sentry Home Household Fogger, which covers up to 12,000 sq. ft. (2000 sq. ft. each can). Sentry Flea & Tick Yard and Premise Spray Concentrate kills fleas, ticks, mosquitoes, aphids, mites, and many other insects in your yard. 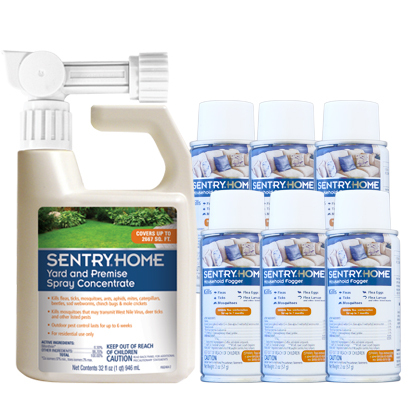 Sentry Home Household Fogger kills fleas, flea eggs, and flea larvae, as well as ticks and many other insects in your home. Sentry Yard Flea and Tick Spray lasts for 6 weeks and Sentry Home Household Fogger provides continuous protection for up to 210 days (7 months). Please note: This item cannot be shipped by air due to Department of Transportation regulations. It can only be shipped via ground delivery. Yard spray covers 2667 sq. ft., 6 cans of flea fogger covers 12,000 sq. ft.
How does the Deluxe Flea & Tick Yard Spray And Home Fogger Combo Pack Work? Sentry Flea & Tick Yard and Premise Spray Concentrate keeps fleas, ticks, mosquitoes and other insects from setting foot into your home by eradicating them in your yard. Sentry Flea and Tick Yard & Premise Spray comes in a concentrate spray bottle. The nozzle attaches to your garden hose and can then be sprayed all over your yard, shrubs, and even flower beds. It contains bifenthrin, an insecticide that stays in the soil for long periods of time, helping to kill insects on contact. Sentry Home Household Fogger contains a combination of ingredients that kills both adult and hatching fleas. It kills hatching fleas before they grow up to bite. Nylar, the insect growth regulator in this fogger, continues to kill hatching fleas for 210 days by preventing their development into adults. The fogger reaches fleas hidden in carpets, rugs, drapes, upholstery, pet bedding, floor cracks, and open cabinets. Occasionally adult fleas may be present in treated areas when reintroduced from infested pets. Not for use directly on your pets. Keep out of reach of children. Wash hands thoroughly with soap and water after handling. Avoid contamination of food or feedstuffs. Fogger: For use only when the building has been vacated by humans and pets. Not for use directly on your pets. Keep out of reach of children. Wash thoroughly with soap and water after handling. Avoid contamination of food or feedstuffs. For use only when the building has been vacated by humans and pets. Use according to instructions. After two hours of fogging, open all outside doors and windows, turn on air-conditioners and/or fans and let the treated area air for 30 minutes before reoccupying. Connect sprayer to hose and turn on the water. Extend the hose out and away from the water faucet so that walking on the treated area will be minimized. Point the nozzle in the direction you want to spray, then bend small plastic tab back and turn knob clockwise to ON position. Follow APPLICATION INSTRUCTIONS for each use appearing on the label. After application: Bend small plastic tab back and turn knob counter-clockwise to OFF position. To relieve the water pressure and drain the hose, bend the plastic tab back and turn knob to ON position until the water stops dripping out of the hose. Then, turn knob back to OFF position. Wait 4-6 weeks between applications. For best results, wait 24 hours before watering. Mosquitoes coming to rest on treated areas will be killed over a varying period of time, depending on exposure of treated areas to weather conditions. DO NOT use more than one fogger per room. DO NOT use in small, enclosed spaces such as closets, cabinets or under counters or tables. Do not use in a room 5 ft. X 5 ft. or smaller; instead, allow fog to enter from other rooms. Turn off ALL ignition sources such as pilot lights (shut off gas valves), other open flames or running electrical appliances that cycle off and on (i.e., refrigerators, thermostats, etc.). Call your gas utility or management company if you need assistance with your pilot lights. Before you fog: Be sure to cover any foodstuffs. Shut off all fans and air-conditioners. Close windows and doors, and remove all pets in the house. Open all cabinets and closet doors. Cover all waxed wood floors in the immediate area of the fogger. SHAKE FOGGER WELL BEFORE USE: KEEP CONTAINER UPRIGHT. Immediately before activating the canister, complete the door hang-tag by filling in the time and date to instruct people not to enter the treated area (premises) for at least two hours following the time of activation. Hang the tag on the door to the entrance. Point the canister away from your face and eyes when releasing (canister sprays straight up). To lock the valve in the open position for automatic discharge, press the valve button down firmly until it snaps into place. Break off and remove the tab on the side of the sprayer. Tilt the canister away from your face (container sprays straight up). Once the canister has been activated, place the canister on the chair, small table or stand (that is covered by newspaper) in the center of the room to be treated. DO NOT RE-ENTER THE BUILDING FOR TWO HOURS. After two hours, open all outside doors and windows, turn on air-conditioners and/or fans and let the treated area air out for 30 minutes before reoccupying. If additional units are used for remote rooms or where the free flow of fog is not assured, increase the airing-out time accordingly. Ventilate the area for 30 minutes before re-entry. If an odor is still detectable, additional ventilation is required. For home -Use one fogger for each 2,000 cubic feet (approximately 16 ft x 16 ft x 8 ft ceiling) of unobstructed area. Store in a cool, dry (preferably locked) place away from heat or open flame, and in an area that is inaccessible to children and pets. Sentry Flea & Tick Yard and Premise Spray Concentrate is a water-based product.